When we work with a school, we hope to make books a part of the daily lives of every student and to ensure that books are always within reach. We are also trying to initiate a broader conversation about reading. One way we hope to accomplish this is by giving 12 books to students who do not have books at home. The other program that is near and dear to our hearts has the same goal. It is the bookshelf project. The idea for the bookshelf is simple: make books available to all children all the time. While most schools have libraries and good librarians, many classes do not visit the library every week. Students may be able to obtain a pass to go to the library when they have completed their work, but students who are not strong readers or already passionate about books may not avail themselves of this opportunity. Students who have not returned a book may not check out another. And stunningly, if a student has unpaid late or lost book fees, they may lose library privileges permanently. That is where the bookshelf comes in. The bookshelf is an honor-system borrowing shelf located in a central part of the school, like the lobby or front hall. Any student can borrow a book whenever and for as long as they want. In schools where bus lines wait in the front hall, bus riders might have an opportunity to peruse the shelf while they wait. The bookshelf is not intimidating—you can mosey up and take something with no pressure or check-outs. We set up a bookshelf at a school last year with approximately 300 books for different reading levels. We were unprepared for the overwhelming response. Students flocked to the shelf every day. Many students who had received books from our distribution (and thus who were not the most avid readers in the school) were daily bookshelf customers. Students were recommending books to one another, picking books to share with siblings, and diving into series. A conversation about books sprung up between students, just because the shelf was there in an easily accessible place. Getting a book from the shelf was easy and fun, and book browsing became a communal activity. We can see so much potential for a school to use the bookshelf as a springboard for encouraging reading. If a class (such as the fourth grade) takes responsibility for the bookshelf, they could take a leadership role in developing literacy activities, featuring books, or developing themes for the shelf. Students throughout the school could submit the names of books they loved from the shelf and would recommend to a friend. The bookshelf could become the starting point for a monthly student newsletter with short reviews or illustrations. Pictures of “readers of the week” could be posted. The bookshelf can be the centerpoint of reading for the school, and students who would not normally be identified as star readers can see themselves in a different light as they become book experts. And students can be encouraged to bring in books they are finished with to donate to the shelf. The bookshelf is open to all students at all times. It is an always available stockpile of reading material so that all students can always have a book to explore. It makes books a bigger part of the daily life of a school and can make reading a more open and obvious fun activity. The bookshelf is a simple idea, but it can have a profound impact. 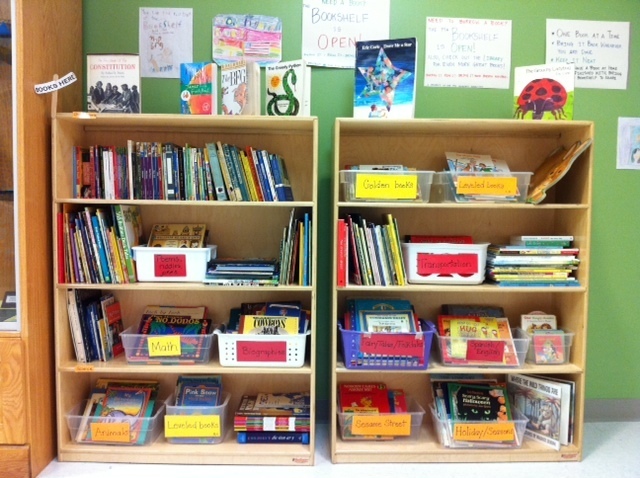 We are so proud of our shelf, and we look forward to creating bookshelves at two additional schools this year. If you want to make an impact on literacy at a school in your area but aren’t ready to head up a distribution project, consider creating a bookshelf. All it takes is a book drive, a shelf, a willing school, someone who is willing to tidy and restock periodically, and a passion for books. If you’re interested in learning how you or your group can set up a bookshelf, contact us at booksaremagic123@gmail.com.